Laura Schmitt NE: Gluten free dairy free lunchbox - salad day. 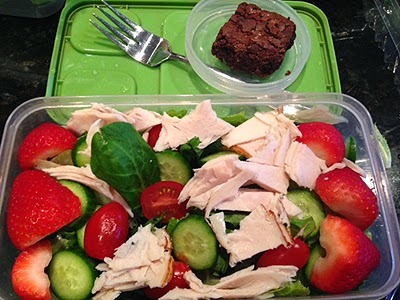 Gluten free dairy free lunchbox - salad day. My oldest is has just moved out of her soup phase and into her salad phase for lunches. To be honest, both area very easy for me to prepare for her, and both are very healthy homemade options, so ... win win! Here you see a simple salad mix of spinach and romaine. I added cucumbers, tomatoes and strawberries today, as well as turkey for protein. My kiddo prefers her salads undressed, so I don't mind sending along a homemade gluten free treat like the brownie pictured above. Some days I opt to send popcorn, a Larabar, or gluten free bread with jam and earth balance. She always carries a water bottle in her bag. Eat up! Need more ideas for lunch and food on the go? Check out this great list of lunches that travel to help you on the way.